I hope that we can both work hard, and that one day, the younger generation in both China and India can call each other “bhaiyaa” (brothers)! In August 2015, with some vague fantasies in mind, I set foot in the incredible land of India. Step after step, I learned about the past and present of Delhi, the tragic love story of Agra, the slums hidden behind the international metropolis of Mumbai, the sunshine and beaches of Goa, the rapidly expanding IT industry of Bangalore, and the glorious past of Mysore. I also visited Calcutta, the hometown of Tagore and Mother Teresa, bathed in Varanasi’s Ganges River, performed the Dharmachakra pravartana mudra (turning the wheel of law) in Sarnath, toured Allahabad where three rivers flow together... In just 10 months, from south to north, west to east, I walked across almost half of the land of India with my own feet. Most of all, I miss my Indian brother, Prayag. He was the first Indian friend to say “ni hao” (hello) to me; he was my language partner, and spent almost every evening practicing Hindi with me. He also studied Chinese, saying that nowadays there are many work opportunities in China. He was eager to have his own Yamaha motorcycle; he thought all Chinese girls are “beautiful”; he loved to help out, drawling “no problem” at any time of day. He always arrived late, and I got used to him saying “panch minata” (give me five more minutes) and then waiting for another half an hour. 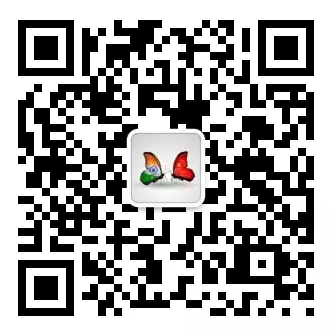 He had loving parents and many warm and charming family members; he spent almost every day practicing the drum, saying that more girls would be attracted to him with this skill; he also asked me to help him install WeChat on his mobile phone, for fear that I would forget him after returning to China. This was my Indian brother, an ordinary guy who, like most Indian youngsters today, was warm, kind, and full of enthusiasm for the future. I once mentioned to him that I had spent one third of my time in India with him, and that a third of that time was spent on his motorcycle. This was no exaggeration, as he always loved to take me to Wardha’s bazaar in the evening, where we would enjoy ourselves eating ice cream, stir-fried noodles with vegetables and Jalebi (dessert), and drinking tea, lassi (an Indian yogurt drink) or sugar cane juice. People in the street would watch me curiously, and Prayag said it was because I was a foreigner. Every three or four weeks, he took me and my Chinese friends to the barber’s shop, and insisted that we got massages every time. He loved mutton, and he invited us to eat together. Prayag and I met every week to see Bollywood movies starring Aamir Khan, Shahrukh Khan, Kajol Devgan, or our favorite, Deepika Padukone. Prayag was also a fan of cricket, and insisted on teaching me to play as well. But he did not keep it up for long, and instead joined our games of table tennis. He loved to browse Facebook and share his life on it, and his avatar is still a group photo of us together. Unlike most young people in India, Prayag was not interested in politics, but in the cult of his king, Shivaji. During Diwali, we went on a tour together. 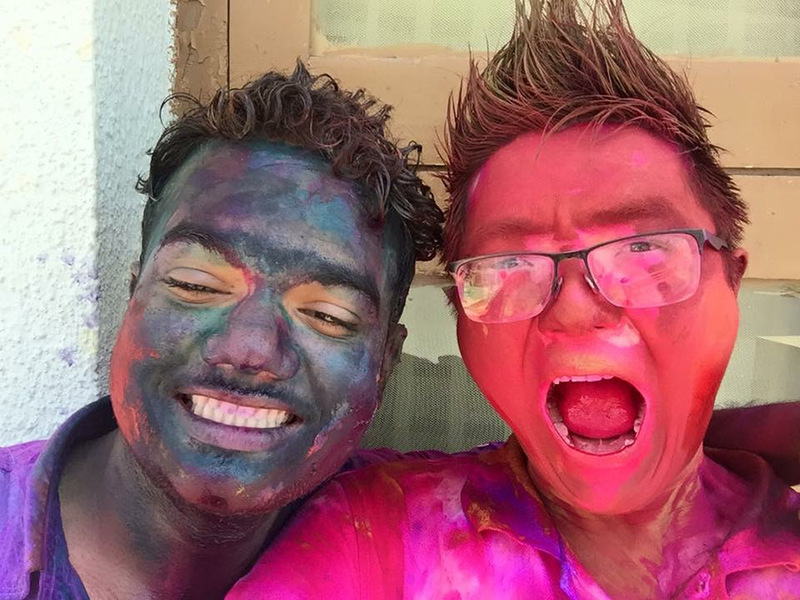 On the day before Holi, we went into town early to prepare our “secret weapons,” and on that day, we were as happy as children. He also took me to Hindu and Muslim weddings, where we ate chicken biryani. 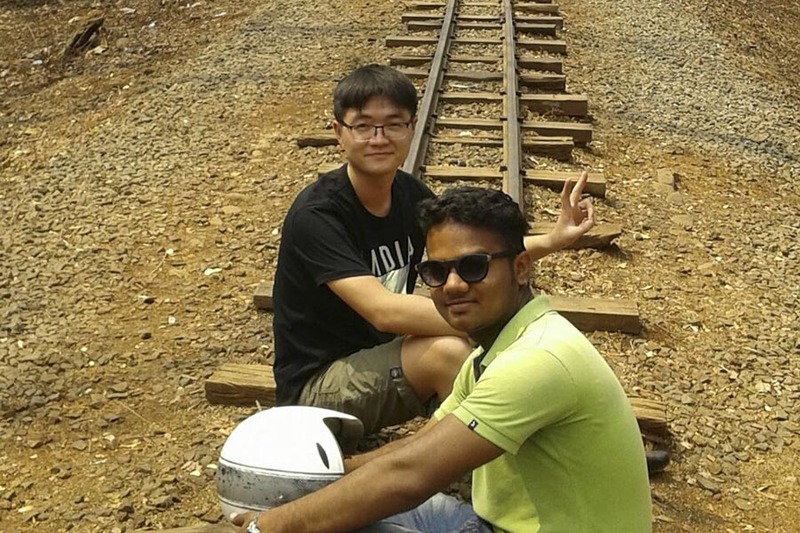 I was often brought along to meet his Indian friends, as Prayag was proud to have a Chinese friend. On one occasion, I rode on his motorcycle to his aunt’s house. His aunt was very hospitable. She prepared mutton especially for me, and asked me to become her Chinese son-in-law, repeating “pakkaa?” (deal?) Another time, Prayag took me to buy a set of traditional Indian clothes, and we agreed that on his wedding day, I would come back to India wearing that suit. Day by day, he drove me along Wardha’s streets and lanes in the burning heat. Ten months soon passed by. I left in a hurry, without spending much time bidding farewell. I did not dare to look back, and left with a simple goodbye, as I still believe I will see him again soon. He always repeated, “Don’t forget me, as you are my best Chinese friend.” I always corrected him, “I’m just one of your best Chinese friends.” In the days to come, we will meet more and more people, and I hope he can meet more Chinese friends. I hope that we can both work hard, and that one day, the younger generation in both China and India can call each other “bhaiyaa” (brothers)!